Our dream has always been to live right up close with family with enough land for a cow and some other livestock. This spring, that dream began to look like a real possibility. The house the Bryan's Uncle lived in while Bry and his siblings were young was bought by an Amish family several years ago. Last year the Amish decided to sell in order to move closer to the wife's family. For a while we hoped that Bry's sister, Molly, would buy the place and move back to St. Lawrence County with her crew but the timing just wasn't quite right for them. Though Bryan had always loved that house and the property, we didn't even think about it for ourselves at that point but this spring the Amish split the propety, offering the house and outbuildings on 2 acres for an incredibly low price. Of course, the plumbing and wiring have been removed and things are in quite a bit of disorder but the septic is sturdy, the well is clean and the land adjoins Gramma and Grampa's house. We discovered that, with a little boost from family and doing all the manual labor ourselves, we could fix the old house up and live where we really want to live for about the same price as our current mortgage. Because Gramma and Grampa live two houses down and Uncle Jonathan and his family will live across the road, we've decided that we'll call our new home the Beorningstead down in Burnett hollow. The process of securing a mortgage for the Beorningstead has been arduous, since BOCES cuts have set Bry back to working part time but our commitment letter finally came a few weeks ago. We have been doing some small projects with the permission of the owner while waiting for our closing date. We are hoping to get moved in before snow flies! 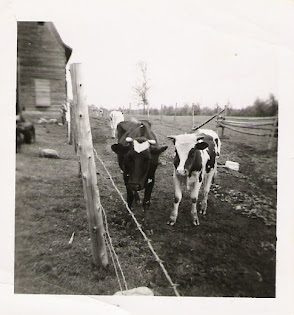 This blog will be about the process of renovating the house, repairing the barns and putting this little old farm to work again.